Last spring, I worked with Lar Lubovitch (’64, dance), performing his Concerto 622 in the spring concert with my classmates, and it was a positively memorable experience. This fall, he selected 10 of us to perform his Artemis in Athens along with dancers from the Lar Lubovitch Company at the Joyce Theater. The performances were in October, and as the semester began, weekly rehearsals were added to our schedules. In conjunction with daily classes and other school-related obligations, the experience certainly set the pace for how senior year would unfold! It quickly became apparent that expectations were high—we were sharing the stage with seasoned professional dancers, which was a rare opportunity—but while it was challenging, it never felt beyond our reach. 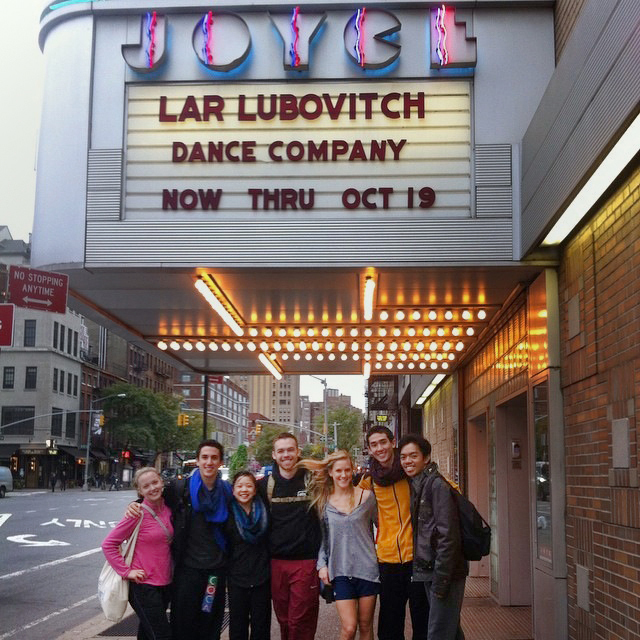 Some of the Juilliard dancers who performed with the Lar Lubovitch company at the Joyce were, from left, Kelsey Connolly, Anthony Tiedeman, Kara Chan, Jordan Lefton, Ruth Howard, Jesse Obremski, and Michael Marquez. That’s partly because the framework of a professional company in performance mode is not unlike that of the Dance Division. Nobody watched over us and dictated our personal stage-readiness routine. The only requisite was to arrive before call time and be warmed up and ready to dance. Although no formal ballet class was given, which is a pre-performance amenity for us at Juilliard, there was studio space backstage for us to plié and tendu at our own discretion. We also learned that as a dancer in a company, you are a team player but it is up to you to follow through with your own responsibilities, such as properly caring for and hanging up your costume immediately following a performance and learning to apply our elf ears ourselves. On a larger scale, we also had to maintain our bodies so we could maintain our stamina, something else we had experience with at Juilliard—we perform New Dances [this year December 10-14] five times in a row. Having done that show for the past three years, I was more prepared to perform seven shows in just five days at the Joyce (and that doesn’t include full dress rehearsals and a press show at the beginning of the week). Rehearsing and performing the same piece for an extended period could easily become monotonous, but it’s our job to find the nuances in the dance and make them our own. This is something that comes purely from experience and maturity—and something our Juilliard experience has also enabled us to do. In Artemis, we could also act more deeply than usual, and even though we were given a general direction, it was exciting to play off my fellow dancers each night and create our own world of nymphs and satyrs. It was wonderful to have another opportunity to work with Lar Lubovitch and his company. I felt truly prepared, and that’s thanks to Juilliard. These performances allowed us to implement all that we have learned our whole lives as dancers including the training and environment that is cultivated at Juilliard.